have an i phone. 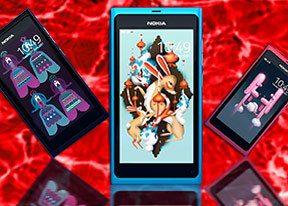 4, thinking of getting the N9, it looks like a phone for people with style. whats the advice. Savor, 24 Oct 2011My first GSM phone was a Nokia. First time I learned how to text, put a wallpaper, put rington... morei totally agree with you. Your comment is so touching. Thumbs up! The N9 will get hack'd to run WP7 and Android 4.0 along with Meego! Sad that Nokia abandoned Meego but wasn't surprised with the move since Stephan Elop used to worked at Microsoft before moving to Nokia. Could be the reason why he is pushing WP in Nokia's handset. when will it be launch in Nepal. nokia is going in wrong direction like apple i seriously hate apple for limited resorce usage and now nokia is remove card slot,fm and the price is so high i am a old nokia fan but now i am thought to buy a new smartphone like galaxy s2 for future proof technology and high quality hardware according to the price. Anonymous, 24 Oct 2011I sell phones for a living and i must say that the Nokia N9 is the best all around expierence ... moreand u think N9 users care how stable symbian is? Nah, we dont want Arm11 processors and max 640 pixels resolution. How can u sell cellfones if u think N9 is Symbian? AnonD-27473, 24 Oct 2011Is that bad?? ?I thought it got the Dolby sound……How sad~I Said sound speekers . The dolby is for hearphones. And is awesome. I sell phones for a living and i must say that the Nokia N9 is the best all around expierence i've ever seen. People are knocking the OS but dont forget Symbian is more stable than Android.